This is the second part of our 2016-17 Winter Outlook series. Our office's winter predictions are available in our Winter Outlook post. While forecasts from folklore can provide an interesting take on our possible winter weather, long-range forecasting is more than just bugs and books. Several large-scale atmospheric patterns including the El Niño-Southern Oscillation, Siberian snow cover, and the Quasi-Biennial Oscillation can give us an idea about the prevailing conditions we can expect during the coming season. Typically, the best indicator of our likely winter pattern is the phase of the El Niño-Southern Oscillation, or ENSO -- a cyclical change in sea surface temperatures across the equatorial Pacific Ocean that has widespread impacts to global atmospheric conditions. A strong ENSO pattern can have fairly prominent effects on our weather. Last winter, for example, saw one of the strongest El Niño events on record, which resulted in our 4th-wettest winter since 1895 in North Carolina. Since then, the warm water along the equator associated with the El Niño event dissipated and was replaced by cooler-than-normal water at the ocean's surface. The current sea surface temperature anomalies of 0.7°C below normal are slightly below the La Niña threshold of -0.5°C, meaning weak La Niña conditions are in place entering the winter. As NOAA's ENSO Blog explains, we're seeing the atmospheric response of the La Niña over the western Pacific. Its influence may already be reaching North Carolina as well. Instead of seeing a potent storm track to our south like we had last winter, La Niña typically weakens the Pacific jet stream. That leads to drier and often warmer conditions across the Southeast US, while the Ohio Valley and Great Lakes tend to be wetter. Aside from the soaking rains from Hurricane Matthew in early October, it has been a dry fall for North Carolina and the broader Southeast, which may be due in part to La Niña, despite its weak status. Because it is weaker and not expected to strengthen much more than the current level, this La Niña's impacts might not be so pronounced throughout the entire winter. Current forecasts give only about a 55% chance of La Niña conditions persisting through the three-month period from December through February. If La Niña fades, its atmospheric impacts could as well. It is worth noting one interesting difference between this year and most other La Niña events: Just north and south of the equator in the Pacific Ocean, the water is quite warm, perhaps a surviving relic of the recent El Niño. It's tough to say what sort of impacts that might have, if any, because such a pattern is fairly rare. According to Texas state climatologist John Nielsen-Gammon, the last such occurrence of cool tropics and warm subtropics was in 1988-89, and prior to that, you may have to go back to the winter of 1931-32 to find a similar setup! If nothing else, this winter will provide another valuable data point to tell us more about the intricacies of ENSO. The ENSO pattern can dictate whether we're mostly wet or dry during the winter since it affects the Pacific or subtropical jet stream, but to get a better idea for whether we'll be on the warm or cool side, we have to look to the polar jet stream and the vaunted polar vortex. As we discussed last year, the polar vortex -- a permanent upper-level low pressure system usually centered over the North Pole -- is the gatekeeper to cold, Arctic air. 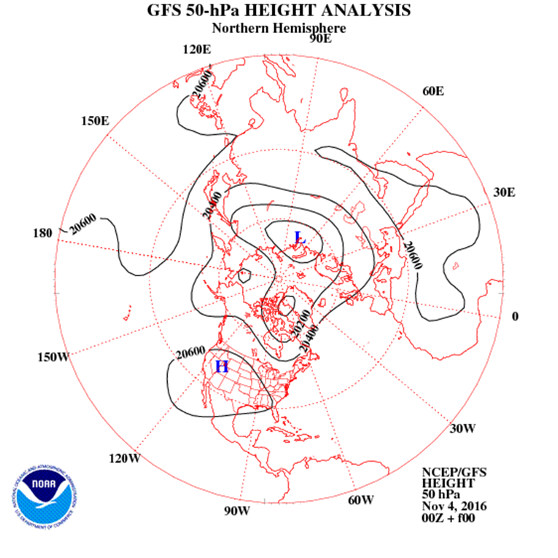 When the polar vortex is strong, the polar jet stream is also strong and tightly confined to the Pole. Likewise, when the polar vortex is weak, the polar jet stream is also weak and wavy, which can open the gates and allow cold air to dive farther south. Although it's difficult to forecast exactly when the polar vortex might strengthen or weaken, a few phenomena can tell us the tendency of the polar vortex during the winter. For one, the buildup of snow cover over Siberia in October cools the surface and releases heat in the upper atmosphere, which causes the polar vortex to weaken. 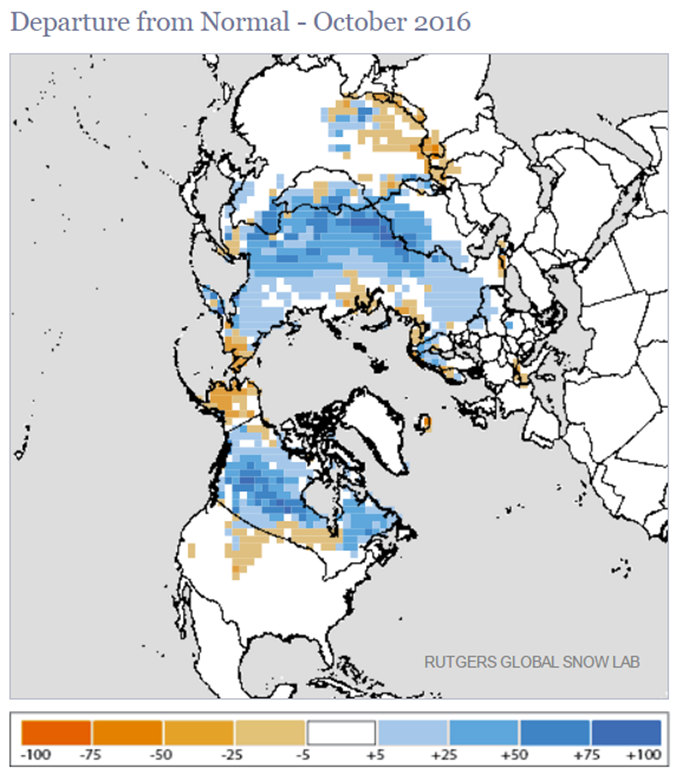 This October had the 3rd-greatest snow cover extent in Eurasia out of the past 49 years, and we may have already seen its effects. Earlier this month, the polar vortex became weak and fragmented, although the coldest air was on the other side of the Northern Hemisphere in Europe and Asia. 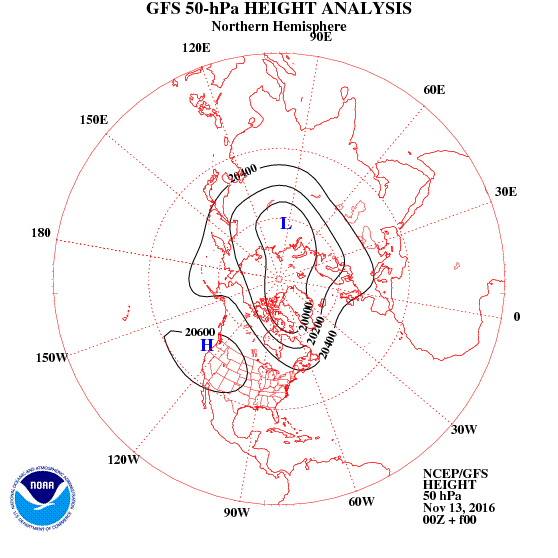 Since then, the polar vortex has strengthened and somewhat reconsolidated over the North Pole. However, current forecasts show the Arctic Oscillation -- one measure of the strength of the polar vortex -- dropping back into a negative phase later this month. That suggests we're in a variable pattern and far from locked into either a strong or weak polar vortex. If the polar vortex does weaken again as the Siberian snowfall suggests it will, we could see periods of below-normal temperatures this winter. But the current volatile conditions, along with the La Niña pattern, make it seem unlikely that cool weather will rule the whole winter. Another indicator of possible polar patterns is the Quasi-Biennial Oscillation -- a measure of the winds in the stratosphere that generally cycle from westerly to easterly to westerly about every 28 months, or quasi-biennially. This spring, though, a funny thing happened. In fact, it was something never seen since stratospheric monitoring began in the early 1950s. 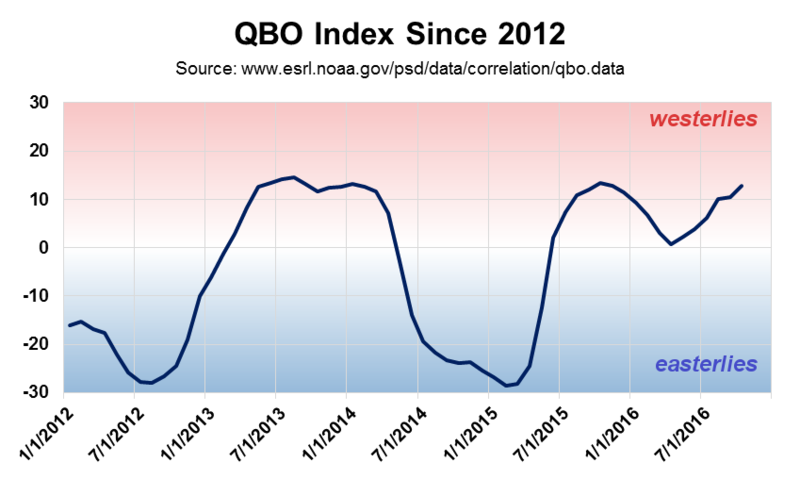 The QBO was positive but decreasing, indicative of weakening westerly winds aloft. But that weakening suddenly stopped and reversed, and as the chart to the right shows, the stratospheric winds have become strong westerlies again. So what does it mean for our winter weather? Over time, those stratospheric winds migrate down to the jet stream level, either reinforcing or opposing the westerly polar jet stream. The stronger westerlies currently in place in the stratosphere could eventually strengthen the polar jet stream, reducing our chances of seeing a weakened polar vortex and sustained periods of colder weather this winter. And as with the interesting La Niña pattern, this unusual event in the stratosphere is likely to teach us more about the inner workings of our atmosphere.